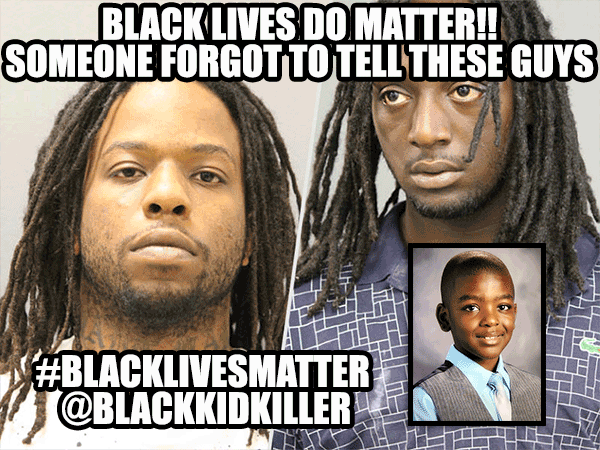 Don't forget these extra special Chicago gang member[s] that gunned down 9 year old Tyshawn Lee to get back at his dad who's also a gang member! Someone should have told them because Tyshawn was a newer black life that, to me, mattered more than other older people's lives no matter the ethnicity. Anyhow, to keep the cycle of violence going, now Tyshawn's dad has been arrested for shooting 3 other people. One victim is suspected to be the girlfriend of the guy who shot his son. Yay! With that google search, I say, why don't they protest in the gang neighborhoods of Chicago? I really think they need to hear the message too.